Bill Self paid tribute to the founder of the Ball’s Charity Golf Classic, then gave an ominous warning to University of Kansas basketball opponents as a kickoff to the 31st Golf Classic. 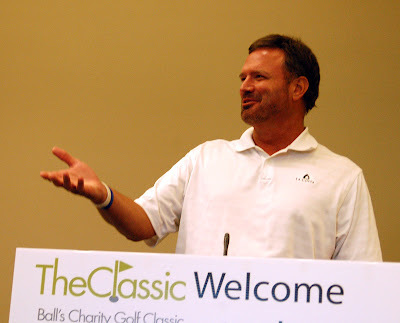 One of the largest if not the largest charitable fund raisers of its kind in the Kansas City area, proceeds from the 2012 Classic pushed the 31-year total contributions to more than $4.25 million. For the first time, the event was held without its founder, Fred Ball, who passed away Oct. 28 at age 77. While several charities have received funds from the Classic in the past, Ball’s President David Ball said the prime benefactor has been the KVC Healthcare Systems directed by Wayne Sims. Self served warning to the Big 12 and the rest of the nation when he predicted “We’ll be good” for his 2012-13 Jayhawk basketball team. That’s ominous because a year ago this time there were no great expectations for the Jayhawks and yet they won an eighth straight Big 12 championship and finished runnerup in the NCAA national tournament. Newcomers include 6-5 Ben McLemore and 5-11 Naadir Tharpe, both of whom sat out last year because of NCAA rulings; national high school player of the year Perry Ellis (6-8) of Wichita Heights; and 6-4 combo guard Milton Doyle, who originally had committed to Florida International to play for Isaiah Thomas but de-committed when Thomas was fired. Self will have a new assistant this year in Norm Roberts, who replaces Danny Manning who took the head coaching job at Tulsa; and a new Director of Basketball Operations in former Nebraska head coach Doc Sadler. Self said he hopes that in the next two or three years KU can add Tulsa to its schedule as well as SMU where former KU coach Larry Brown has returned to the coaching lines. A total of 300 golfers including 29 professionals from the Midwest Section of the PGA played in this year’s Ball’s Charity Classic held at The National Golf Club and The Deuce in Parkville, Mo. Paul Resner of the National and Chris Mabry of Lake Quivira each shot 68 at The National in the PGA competition. Diamond (all 59) – Jim Coddington, Craig Kassing, KC Mathews, Jon McCormick, John Turnage, Hodge Park pro Tim Underwood; 2. Tim Cosens, Steve Keller, Rick Krause, T.J. Morris, Tommy Morris, Twin Hills pro Taylor Griffith; 3. Terry Glynn, Justin Heldenreich, Greg Pryor, Rich Rowland, George Williamson, Indian Hills pro Joseph Yashuk. Platinum (all 62) – 1. John Barrett, Steve Cox, Neal Schumacher, Mike Sullivan, Peter Raith, Fred Arbanas pro Jeffrey Sedorcek; 2. Ed Addington, Chris Conrad, Ellen Kreimendahl, John Pashea, Hallbrook pro Blake Graham; 3. Greg Albers, Bob Caliendo, Matt Cannon, Steve McDaniel, Randy Moore, GolfTec pro Dale Browne. Gold (all 65) – 1. Jeff Ebarb, Bo Hawkins, David Gates, Kevin Post, Bill Quade, Loch Lloyd pro Nathan Sargent; 2. Kelly Flynn, Drew Heenan, Gary McKeever, Alan McKeever, St. Joseph CC pro Jesse Luedtke; 3. Andy Burczyk, Tom Dahl, Chris Fernandez, Tim Soptick, Greg Wiemers, Leawood South pro Charlie Mahon. Contest holes – Closest to pin: Steve Cox, No. 2; Charlie Haufman, No. 4; Drew Heenan, No. 6; David Shapiro, No. 14; Pro – Matt Murdock, Mission Hills, No. 16; Longest putt, No. 18, Kevin Post. Diamond – 1. Terry Taylor, Mike Parrish, Derek Garwood, Scott Mannix, 57; 2. Nick Pasley, Joe Pittmanm, Jim Besiada, Ryan Stubbs, Kevin Nelson, 58; 3. Sean Hurley, Bart Hoolehan, Larry Stephenson, John Witt, Tim Kupersmith, 59. Platinum – 1. David Quarles, Kevin Turpen, Clark Benner, Mark Croft, Brandon Kincaid, 61; 2. Phil Merz, Rick Johnson, Lewis Vandover, Mike Pizzichino, Chad Borland, 61; 3. Joe Cali, Lou Malaponti, Steven Ware, Steve May, David Haun, 61. Gold – 1. Frank Vigliaturo, Cole Wilkerson, Heath Kern, Michael Newhold, Donald Reynolds, 65; 2. Mark Korsmeyer, John Stephens, Chuck Erickson, Jim Koerber, David Call, 65; 3. Rick Fiser, Bill Surman, Tim Holzman, Scott Keller, Rusty Binkley, 66. Contests – Closest to pin: Bart Hoolehan, No. 6; Joe Pittman, No. 8; Marilynn Koehler, No. 11; Rex Worboys, No. 15; Deb Cummins, No. 17; Longest putt, No. 16, Mike Parrish. Midwest PGA Section (at National) - Paul Resner (National), 68; Chris Mabry (Lake Quivira), 68; Blake Graham (Hallbrook), 69; Clay Ederer (Meadowbrook), 70; Mike Tanner (Overland Park), 70.